How to secure your Helmet to your Motorcycle with a Holder? Sometimes you may need to place your motorcycle helmet on a location on your motorcycle for whatever reason. These reasons could be that you want to store your helmet with your motorcycle when not in use or you may want to have a place to hold a second helmet, which may be for additional passengers. However it is not a simple as just purchasing a second helmet. You’ll need a proper location to store the helmet that manages to reach certain criteria. Without the fulfillment of these criteria you will not have a very good place to store your motorcycle helmet, so it is important to be vigilant and be sure that you look into every option. What should I look for in a motorcycle helmet holder? Having a secure motorcycle helmet holder is the basis of the item. If the helmet cannot be stored correctly and safely on the motorcycle then it defeats the purpose of having a motorcycle helmet holder. The helmet should be securely fastened to the motorcycle so that it does not wobble or have a chance to get pulled or fall off when moving. The material used to keep the helmet secure should also be durable itself. The quality of the material links back to how securely it fastens the helmet to the motorcycle as well as ensures that there will be no issues with how long it lasts for or the amount of times you can use it before it wears out and stops performing its duties effectively. Additionally you want to be sure that when you are using the holder that the helmet can be accessed easily when needed. You do not want the added hassle of having to struggle to get something that you did not anticipate struggling over. The method of getting your helmet should be simple and worry free so you can focus on more important things. What are some motorcycle helmet holders I should look into? 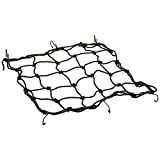 This bungee cord is designed to stretch over the back of you motorcycle and hold down a helmet or other loose item. It has been designed with high quality bungee material so it can stretch easily and keep a helmet securely fastened to the back of the motorcycle, as well as accompanied by 6 attachments to help keep it firmly in place when in use. Reviewers have found it to refined to considerable strength and durability as well as making sure that items are kept safe and securely. Additionally people enjoy that it is cheap, lightweight and extremely easy to use in comparison to the alternative of carrying the spare helmet around with you or not having a spare helmet at all. Some reviewers have had issues with the quality of the material and the durability after the cord has been stretched or has been left out for long periods of times. Whilst the item does tout itself as being both durable and long lasting, it is uncertain whether or not the reviewers have overstretched it or left it out in conditions that are detrimental. One such method that you might want to employ when looking for a way to carry your additional motorcycle helmet would be to purchase a helmet bag that can be carried with you. This helps to optimise the storage locations as well as keep he helmet safe from scuffs and marks, with the additional benefit of padding around it. This motorcycle helmet bag has weather-resistant, PVC-backed nylon outer fabric with a six-inch pocket and Velcro fastener. Alongside this is a full-length, two-way zipper and helmet D-ring lock port. 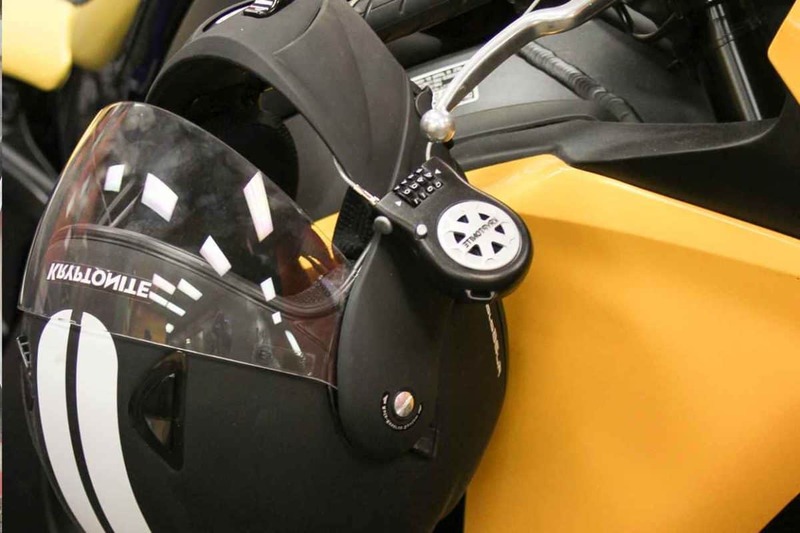 This essentially allows your helmet to be stored securely in the bag and accessed at any time with ease and simplicity despite the complex safety. Reviewers love the fact that the helmet bag material is extremely durable and can sustain regular everyday use without any noticeable differences. Additionally it has the capacity to contain the helmet and also any additional accessories for your motorcycle that you might want to carry with you such as extra gloves or sunglasses. This backpack offers more than just a motorcycle holder location but also the conventions of a backpack so you can carry stuff with you for regular and extended travel. It has multiple features to improve on a regular backpack making it much more viable as a motorcycle backpack with the ability to carry motorcycle accessories. Some of the feature available with the backpack includes its capacity to hold from 24 to 32 liter in terms of storage space. It also has a rain cover and waterproof zippers to keep the contents secured and safe from the elements, especially if you’re wearing it on the motorcycle whilst you’re on the move or commuting on your regular day. One of the advantages of this bag is the integrated helmet holder, allowing you to put your own helmet on the backpack or pack an additional helmet whilst you’re wearing yours. Additionally reviewers really enjoy the fact that the bag is strong, durable and has very efficient water protection capacity that is well suited for motorcycle riding. With all of this information in mind hopefully you’ll be able to see the differences in the items available to help you make a decision on what item is best for holding our motorcycle helmet. Considering that there are different styles shown, you should not have any problems identifying which one best suits you and being able to keep safe.